The village of Ford lies on a minor road at the southern end of Loch Awe in Argyll. It is an ideal base for exploring the stunning archaeology of Kilmartin Glen and the rich diversity of wildlife and landscapes that typify this part of Scotland. Crown House dates from the late 18th century and has been a drovers’ inn, change house, Forestry Commission office and latterly, a private home. 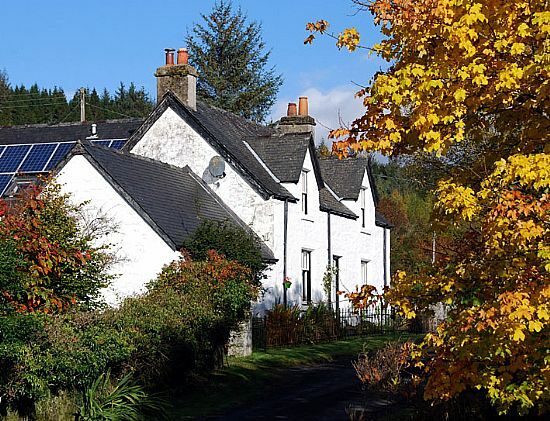 Many guests have passed through its doors, from unknown drovers heading to Glasgow from the Isles to one or two more famous ones, such as John Keats, who stayed here during his tour of the Highlands in 1818. We have two bedrooms, one ensuite double and one family room with double and single bed and a private bathroom. We welcome walkers, cyclists and motorcyclists and have drying facilities and secure storage for bicycles. We aim to use local produce where possible, bake our own bread and, depending on the time of year, our bees will provide the honey! We are proud to be members of the Heart of Argyll Tourist Association (HOATA). Discover Dalriada!